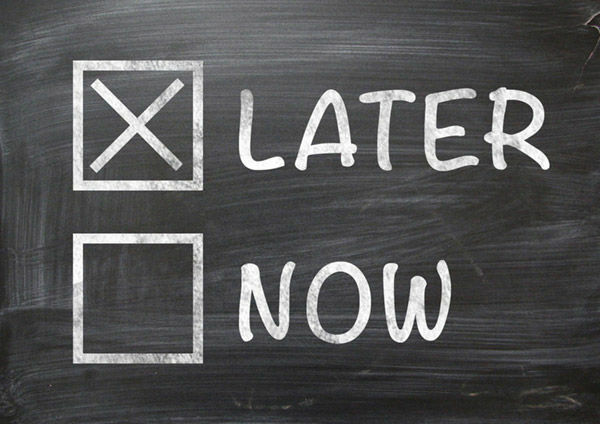 According to an article in Psychology Today, twenty percent of people identify themselves as chronic procrastinators. What’s more, they say procrastinators lie to themselves and say that the “time pressure makes them more creative.” Unfortunately, says the magazine, they do not turn out to be more creative; they only feel that way. As we transition to a new year it seems that every other article and news story touches on New Year’s resolutions. Quitting smoking, getting more exercise, learning a new skill, losing weight, finally putting an end to biting your nails … there’s no end to the things we resolve to do. When you look closely at most resolutions, you’ll find something that the resolver has been putting off doing. Almost no one wakes up on January first and decides—out of the blue—to give up cigarettes or learn to speak Mandarin. Most likely it’s something they’ve been mulling for quite some time. It just takes the event—in this case a new year—to give them the impetuous they need to take action. And that’s what a swiftly approaching deadline does for me—first it gives me an adrenaline rush (you’ll find more on that in the article); What if I miss the deadline and all heck breaks loose? But I’ve also consistently found it serves as motivation to really buckle down, tune out distractions and get to work. In addition, I find that the time I appear to be wasting is really not wasted at all. Subconscious parts—and in short bursts here and there, even some conscious parts—of my brain are working on the project all the time. When I finally sit down, deadline looming, to accomplish my task I’m usually halfway there. I’d argue that my system is actually an exercise in efficiency since I can work on other things while my subconscious deals with the problem or project I’m putting off. Unfortunately what we did have was other work, and with five ideas in the bag, little additional time that could be devoted to this project. I was busy, but not satisfied. Then, just before the presentation, I woke up out of a sound sleep with an idea. A sort of off-the-wall idea. An idea that approached the challenge of communicating the milestone’s significance in a new way. An idea that I really thought was, “it!” And, thankfully, when we presented just a couple days later, so did the client. (Insert brow wipe here.) The winning concept was born out of a form of procrastination. Just as no specific hat fits every head, no specific work style fits everyone. You may be a methodical planner, and that’s great if it works for you. But I’m not, and that works for me. So instead of resolving to deal with my tendency to procrastinate, I’m going to celebrate it. In fact, I’m celebrating it right now. It’s 2:57, my blood is pumping, and I have to leave the office at 3:00. Viva la procrastinators!